Paintball is a sport where the competing players eliminate opponents by targeting and hitting them with capsules that contain paint called “paintball” from a gun specially designed for the game called the ‘paintball marker’. Games can be played indoors or outdoors with varied field sizes. The game field is designed with artificial terrains that the players can use for strategic play. This sporting game have attracted the attention of people over 10 million in the United states alone. Paintball, based on statistics, have been found as a safe game to play – said to be safer than tennis. The paintball is filled with polyethylene glycol and other non-toxic water-soluble substances and dye formulas. When it hits the opponent, the paint marks will show declaring that he is out of the game leaving the others to continuously play. The team who eliminates all other opponents is the winner. How to Make a Paintball? The paint used in a paintball should be biodegradable, water-soluble, can be easily rinsed out of clothing, and can be taken of human skin with plain water. The player that gets hit by the paintball is left with a stain mark of a splat that can be washed off with soap and water to make him ready for the next game. The gelatin is melted. The hot gelatin is molded into two thin gelatin ribbon each made to pass over a rotating die casting. The body of the die casts is usually made of aluminum alloy that can form paintball capsules of standard shapes and sizes. Softgels can be spherical in shape or can also be unusually shaped. The die casts press against each other as they rotate to make the softgels. The opposite sides of the die are filled with paint and when they meet, the paint is injected into the area between sheets. The die remains rotated with both sides pressing against one another to form a filled pellet. The seam on the capsule will determine where the two sheets met. The gelatin will then be sealed and taken out of the rotating die. 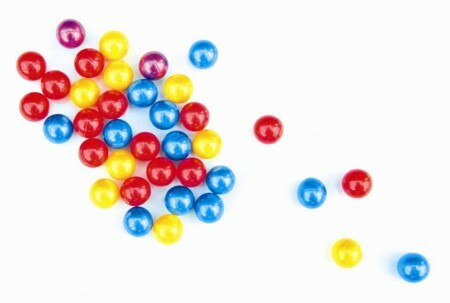 The paintball is dropped out of the paintball making machine and comes out rubbery and large enough to be used for the game. The capsules appear bouncy and have to be arranged in trays to allow them to dry making the gelatin shrink while drying. Technicians who operate the manufacturing of the paintballs monitor the encapsulation machines time after time and randomly check the quality of paintballs made to see if these will pass the qualifications and specifications of every production. A final check is done when the balls are dry. Then, the paintballs are ready for use.